IEC manufactures leveling mounts, swivel levelers, rigid levelers, hex levelers, adjustable feet, leveling pads, furniture glides, leveling feet, leg levelers, swivel glides, rigid glides, tack glides, chair glides, table glides, desk glides, adhesive backed felt pads, self stick felt pads, floor protectors, furniture sliders, moving sliders, plastic sliders, peel & stick polyurethane pads and bumpers, threaded tubing inserts, tube ends, tubing caps, vinyl caps, vibration mounts and custom threaded components. Click on link or catalogs photo above to see new catalogs, new shopping carts and new website. PRODUCT FAMILIES NOT SHOWN ABOVE: Low Profile Swivel Levelers (Socket Type). . . Nylon Based Swivel Levelers (Stud Type) with Rubber Pad. . . Nylon Based Swivel Levelers (Socket Type) with Rubber Pad. . .Knob Style Socket Levelers. . .Knob Style Stud Levelers in Red, White & Blue (any color available). . .4" & 6" Furniture and Appliance Legs. . . Caster Wheel replacement glides. . . Vinyl Caps. . . Angled & Swivel Plastic & Felt Based Tube Caps. . . Slip-Over Felt & Teflon Based Tube Glides, Triangle Felt Pads, Felt Tubing Wraps, Wood Screw Felt Pads. . .Domed Caps. . . Patio Furniture Caps. . . Knobs & Handles. . . more products shown below. To order online, order through the shopping cart link(s) below. Sorry, not all products are available for online purchase yet. Example: The heavy & medium duty levelers are not availble for online ordering, nor are the knobs and vibration mounts. You can always call us to place your order. We are happy to discuss your application with you. Billing and Shipping address: International Equipment Components, Inc.
All product families shown below on this HOME page. To print pages in our site, click on or highlight a word anywhere in lower frame (below yellow menu bar at top of this page) before printing. You can also print using "all frames" or "as shown on screen" using the options of the print menu. Click here to request a free IEC Heavy & Medium Duty Leveler catalog... e-mail your shipping address. Click here if you have an URGENT need for a free IEC Heavy Duty Leveler catalog.. e-mail your shipping address. Click here to request a free IEC Light & Medium Duty Leveler catalog... e-mail your shipping address. Click here if you have an URGENT need for a free IEC Light Duty Leveler catalog.. e-mail your shipping address. Call to place your order @ 562-597-4533. Fax your order to 562-498-2275. Click here to Place an Order via e-mail. We realize that you may not always require $20-$25 worth of products so we are now offering Mini multi-pliers (with LED flashlight), Carabiner bottle opener/knife (with LED flashlight), baseball caps, rulers, box-cutter pocket knives, pens, screw-drivers, can coolers (koozies), coffee mugs and peace pins as additional items you can buy in order to help you reach the $20 minimum. These items are available on most of our shopping carts (also on the "Must-Have" cart), or you may order them when you place a phone order. Some of these items come from our sister site: WorldPeaceNewsletter.com. Furniture feet, caps & plugs, felt pads, teflon sliders and non-skid rubber pads are other items you can purchase to reach the $20 minimum. Remember that you can go to any of our shopping carts and items placed there from IEC's other carts will be there until you check out, even if you leave and come back another day using the same computer (they are saved automatically). IL20-3 (7/8"); IL20-4 (1-1/8"); IL20-NS (1-1/8" swivel); IL20-NW (2" long, -NB for brown); IL21-5-FELT-FLAT-BR (1") (top photo); IL21-5-FELT-NAIL (1") (oval bottom). 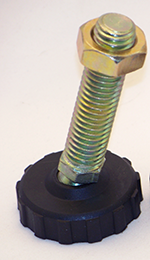 NEW PRODUCTS - Vibration Isolators and Rubber Bumpers - February 2010 - Call for pricing and delivery. Many uses include vibration mounts/feet, heavy-duty door bumpers, equipment isolators, flexible connectors, non-skid applications, noise control, etc. NEW PRODUCTS - Knobs & Handles - August 2009 - Call for pricing and delivery. You can call us to place your order @ 562-597-4533. You can fax your order to 562-498-2275. Click here to request Price & Delivery. Click here to request a phone call from an Applications Engineer. Click here for General Order Information. Click here to request a Fax of a catalog page. To order online, you must order through the shopping cart link(s) near the top of this page. The heavy & medium duty levelers are not availble for online ordering yet. You can always call us to place your order. We are happy to discuss your application with you. Click on link or catalogs photo above to see new catalogs and website.